Akeel Abbas, Toby Dodge, Zeynep Kaya and Christine van den Toorn speak at the final panel of the workshop. The period from July 2017 to May 2018 could prove transformational for Iraq. In July 2017, Iraqi government forces liberated Mosul from Islamic State (IS). In the aftermath of that victory, President of the Kurdistan Regional Government (KRG) Masoud Barzani pushed ahead with a referendum on Kurdish independence to enhance Kurds’ bargaining power in their disputes with Baghdad. This backfired and instead the Iraqi Prime Minister, Haider al-Abadi, ordered Iraqi forces into Kirkuk, the disputed territory between Baghdad and Erbil, in October 2017. These momentous events form the background against which Iraq will vote in the May 2018 national elections. This vote will not only decide if Abadi gets a second term, but also whether Iraq has moved beyond the divisive sectarian rhetoric that has dominated the country’s post-regime change politics. 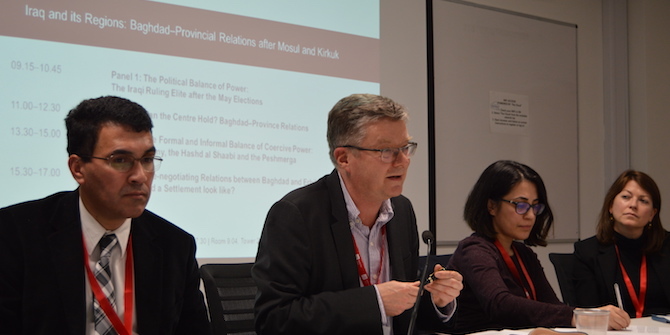 The LSE Middle East Centre convened a workshop on 15 January 2018, bringing together Iraqi political analysts and decision-makers with other experts on Iraq. The workshop examined the major dynamics that will shape Iraqi politics going forward and drive the relationship between Baghdad and other regions of Iraq, as well as between state and society. The workshop was split into four sessions. The first examined the current political balance of power in the run up to the May 2018 elections and the potential alliances emerging among the Iraqi ruling elite. The second highlighted the fraught relationship between the capital and the provinces, and asked whether a programme of federal decentralisation was viable. The third looked at the security sector and the dilemma of multiple actors reserving the right to exercise coercive power within Iraq, including the Iraqi Army, the Hashd al-Sha‘abi and the Peshmerga. The final panel discussed the possibility of resetting relations between Baghdad and Erbil, and the weak position the KRG now finds itself in. This blog series features a selection of the presentations from the workshop. This is the introduction to the proceedings of a workshop on Iraq and its Regions: Baghdad–Provincial Relations After Mosul and Kirkuk, held at the LSE on 15 January 2018. See below for the full list of papers.